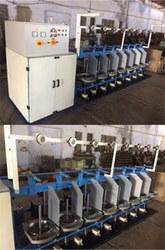 We are a leading Manufacturer of online ring winder machine and ring twister machine from Gandhinagar, India. Online Ring Winder is used for Twisting and Winding of the filaments drawn directly from the Extruder. This will reduce the percentage of waste and helps to save Electric Power & Time. Moreover, this machine will replace the use of Bobbin Winder from the Extrusion Plant. Available in multiple Spindles as per customer requirement, from small production output through 12 no. to 48 high end output.Spindle gauge available for online ring winder is from 12” to 15” as typical requirement. Denier range of 5000 denier to 40000 denier. Optimum production & Easy to operate. Less noisy & less power consumption. NOTE: Price may vary dependning on the Spindle. Our ring twister machine is a versatile machine, it’s customized to suit client requirement it gives large range diameter to suit different product, thread and output needs. A ring twisting diameter range of 2.1/2" 3" 3.1/2" 4.1/2" 5.1/2" 6.1/2" 8.1/2" 10" gives this machine the right mix of blend to facilitate large variance in fiber. Machine is suitable for Multifilament Nylon, HDPE, Fiber Glass, Natural fiber, man-made fiber, fabricated tapes, paper twisting, Jute etc. Machine model is spindle dependent ranging from 60 to 440 nos. which can also be made to fit demand, with variable spindle gauge (3.5” to 14”) and ring diameters (2.5”to 10”). Machine lift and denier range (100 to 35000) gives desired output to best suit high end output. Note: Prices are as per spindle.